AUGUSTA, Ga. (AP) — Ed Sneed sat on a sofa in Butler Cabin at Augusta National looking as though he didn’t know what hit him. 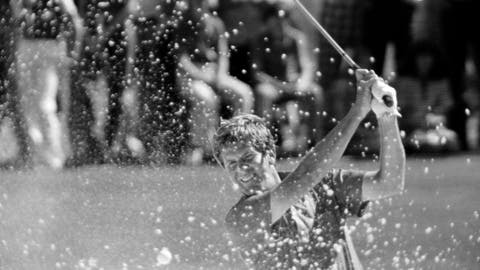 He had a three-shot lead with three holes to play in the 1979 Masters and didn’t do anything horribly wrong, except nothing went right. He finished with three straight bogeys and faced a sudden-death playoff with Fuzzy Zoeller and Tom Watson, which Zoeller won with a birdie on the second extra hole at No. 11. The fabled green jacket is almost close enough to feel it slipped over the shoulders, and then it’s gone. And for some, the opportunity never returns. Mattiace’s only chance was in 2003, right after Augusta National had super-sized the golf course. Even with a bogey on the 18th hole, Mattiace shot a 65 in the final round and was on the verge of winning until Weir finished with two tough par putts. Campbell returned to Augusta National the next year, with no reason to believe that would be his last year. He doesn’t let much in life linger. If anything causes him to think back, it’s the Masters. “The longer it goes, you look back and feel like it’s the one that got away,” he said.